A signpost to a site that no longer exists marks the location of Pabellón. 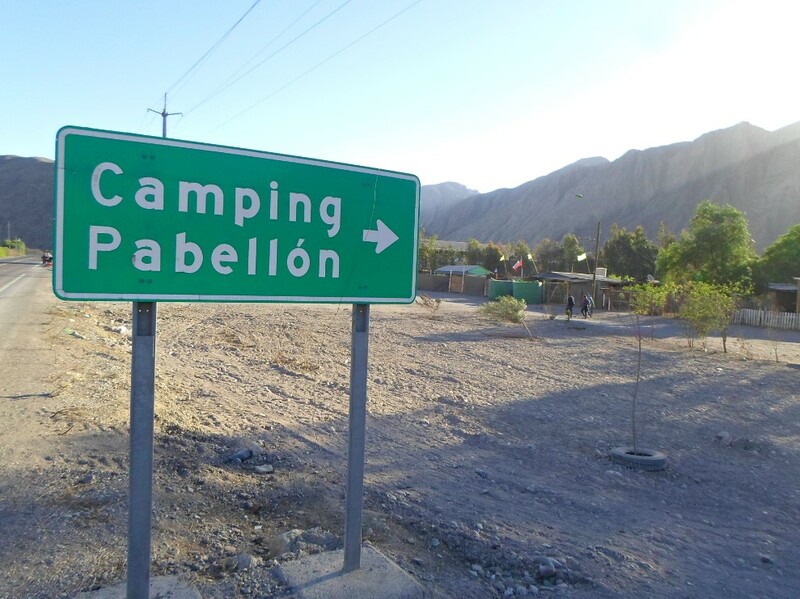 Travelling along route C-35, running eastwards from the Chilean city of Copiapó, you will drive past a signpost marking the entrance to “Camping Pabellón.” However, if by chance a traveler decided follow the sign, she would find no camping whatsoever. Photo taken by Sebastián Ureta. Taking a dirt road along which a dozen houses are built, the traveler will then cross a narrow bridge over the slim Copiapó River. On the other side, she will find an almost completely empty grey wasteland that extends for several acres and is surrounded by mountains. After seeing this, it is quite difficult to imagine that Pabellón was once a flourishing industrial town. Located at a key junction between Copiapó and the Chañarcillo silver mine, which was one of the richest mines in the world during the nineteenth century, Pabellón rapidly grew to become an industrial hotspot that housed several mineral processing complexes. However, when Chañarcillo experienced substantial decreases in production (it had all but closed by 1920), Pabellón went down with it. First the industrial complexes closed down, then most of the population departed, and within a few decades the town had been reduced to a dozen houses by the side of the road. While at first glance there is an absence of the ruins one might expect to find in such a place, a closer inspection, however, reveals another key remainder of Pabellón’s industrial past: tailings. One of the most prominent by-products of mineral processing, tailings are formed by “the ground-up gangue from which most of the valuable mineral … has been removed” (Lottermoser 2007, 153) and usually contain various highly toxic chemicals, such as mercury and cyanide. 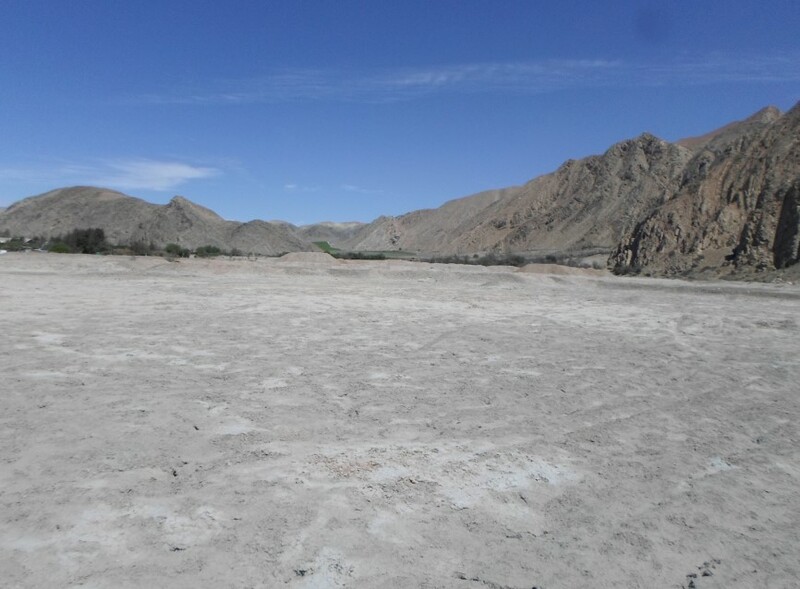 In Pabellón, tailings take the form of several hundred tons of greyish soil spread beside the river. Although there are no records, it is easy to assume that after the closure of the mineral processing plants their tailings were simply left there, rapidly falling into complete oblivion. The situation only started to change a few years ago, when an environmental risk assessment exercise found that Pabellón’s tailings have the highest concentrations of arsenic and mercury in the region. Given that the current population lives in close proximity, the toxins have become a matter of concern for environmental authorities. One key emerging issue is how such tailings should be dealt with. The model currently favored by Chile’s environmental authorities, which is derived from the US Environmental Protection Agency’s Superfund program, is to undertake a full environmental restoration of the site. However, such mandate has to compete with the nationwide regulation of several other sources of pollution, so in practice the available resources to intervene in Pabellón has been limited to only carrying out exploratory research. One alternative path to rescue Pabellón’s tailings from their current oblivion is by considering them as chemical rubble. Contrary to conventional notions of ruins, Gordillo proposes to see past remains as rubble as a way to “deglamorize ruins by revealing the material sedimentation of destruction” (Gordillo 2014, 10). Rubble always is in a process of transformation, of continuous ruination (Stoler, 2008), “where ruination itself, the active process of withering and decay, becomes conspicuous and draws our attention” (Pétursdóttir & Olsen 2014, 7). The notion of chemical rubble asks us to change our usual scales from decaying buildings and infrastructures to the microscopic level of human-induced chemical ruination. As the chemical level tailings are characterized by an exuberant vitality, their multiple components are continually mutating, forging new bonds. In the Pabellón case, the notion of chemical rubble adds a layer of historicity to such a process: these bonds can be seen as a direct consequence of the processes of ruination that these tailings have experienced since the last mineral processing plants closed down. Liberated from their human and material caretakers by oblivion, tailings’ bonds with human and nonhuman entities (especially toxic ones) proliferate. From the perspective of rubble, ruination appears as “a mode of disclosure or revelation, and thus a form of recovering or bringing forth new or different memories” (Pétursdóttir, and Olsen 2014, 11). Seen as chemical rubble, Pabellon’s tailings do not become “simply a figure of negativity. Rubble exerts positive pressure on human practice” (Gordillo 2014, 11), calling us to start “caring” for them (Puig de la Bellacasa 2011; Ureta 2016). In this particular case caring should involve reassembling the historicity of these tailings in at least two main senses. On the one hand, the notion of chemical rubble should force us to widen our conceptions of the legacy of mining. More than just old buildings and/or infrastructures, the legacy of mining areas should also be seen at the microscopic level, as a chemical legacy formed by all the different kinds of new chemical components produced and/or introduced by past mining activity, for which we have to take responsibility just as much as we have for more conventional ruins. A first step in this direction is to simply start including tailings, in their materiality, on our accounts of past mining activities, something that is seldom done. 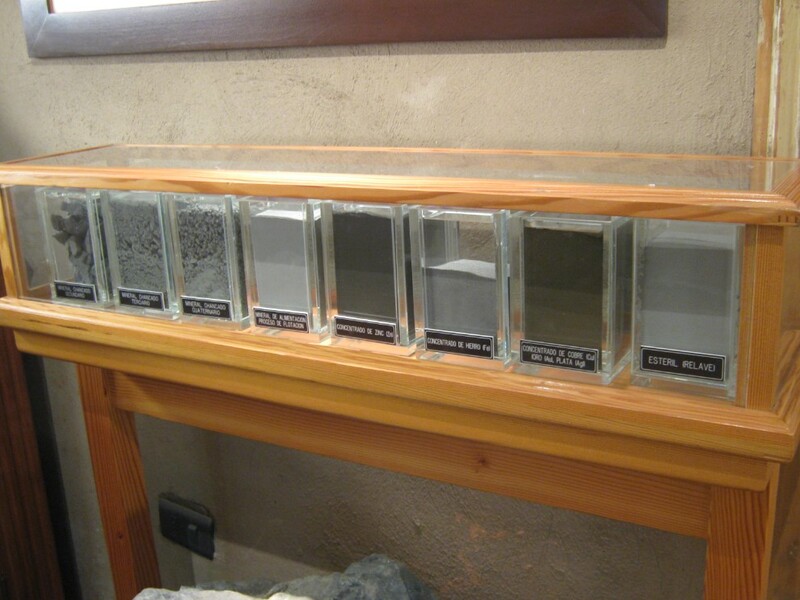 I found an exception to this trend in the mining museum of Tierra Amarilla (the municipality in which Pabellón is located), where tailings (labelled as “Esteril (relave)”) are included in a cabinet displaying the different minerals extracted from the region. On the other hand, regarding tailings as chemical rubble should force us to broaden the focus when restoring sites such as Pabellón. Besides the usual emphasis on studying the site’s current chemical components, especially in terms of their toxicity, the notion of rubble challenges us to unearth the historicity of these materials. Besides establishing their origins (in terms of production, original chemical composition, etc. ), a specific focus should be put on their ruination, or the study of the multiple natural and social processes that resulted in the tailings being left there for decades without any kind of care, slowly establishing toxic bonds with their environment. Ureta, Sebastián. “Chemical Rubble: Historicizing Toxic Waste in a Former Mining Town in Northern Chile.” Environment & Society Portal, Arcadia (Autumn 2016), no. 20. Rachel Carson Center for Environment and Society. https://doi.org/10.5282/rcc/7704. Gordillo, Gastón. Rubble: The Afterlife of Destruction. Durham & London: Duke University Press, 2014. Lottermoser, Bernd. Mine Wastes: Characterization, Treatment, Environmental Impacts. Berlin: Springer, 2007. Pederson, Leland. La industria minera del Norte Chico, Chile: Desde la Conquista a 1963. Santiago de Chile: RIL Editores, 2008. Pétursdóttir, Þora, and Bjørnar Olsen. Ruin Memories: Materialities, Aesthetics, and the Archaeology of the Recent Past. London: Routledge, 2014. Puig de la Bellacasa, Maria. “Matters of Care in Technoscience: Assembling Neglected Things.” Social Studies of Science 41, no. 1 (2011): 85–106. Stoler, Laura Ann, ed. Imperial Debris: On Ruins and Ruination. Durham: Duke University Press, 2013. Ureta, Sebastián. “Caring for Waste: Handling Tailings in a Chilean Copper Mine.” Environment & Planning A 48, no. 8 (2016): 1532–1548. Sebastián Ureta is an associate professor in the Departamento de Sociología, Universidad Alberto Hurtado in Santiago, Chile. Currently he is developing a research project analyzing the multiple ontologies of industrial waste in Chile, in particular the massive waste produced by the country’s booming mining industry. Since March 2015, he is also the PI of the Millennium Nucleus for Energy and Society Research, a new research group studying the interrelations between energy issues and society in Chile.